Zeppoline with Zucchini Flowers Ingredients: for 6 persons 500 gr of flour, 350 gr of zucchini flowers, leaven, salt, extra-virgin olive oil to fry. Preparation: Mix in a bowl the dough, salt and leaven and dilute in a small amount of lukewarm water. Gather the dough with your fingers, adding water as required to achieve a soft, fluid paste. Cover and let leaven for one hour. Then distribute the flower zucchini and use an oil soaked spoon to fill the flowers with the paste. Gather and fry them a few at a time in warm oil. Transfer the golden colored zeppoline onto an absorbent paper and sprinkle salt. Serve still warm. Bean Soup Ingredients: 300 gr of beans, 1/4 onion, 1 garlic clove, 1 celery, cabbage,1 black cabbage, parsley, 2 table spoons of tomato sauce, extra-virgin olive oil, marine salt. Preparation: Cook the beans in two liters of water. Meanwhile, fry the onion, garlic, parsley and celery thinly minced. Add two ladles of the bean soup and add the cabbage and tomato sauce. Upon boiling, pour in the bean soup pot. When done cooking add salt and season with olive oil. Chickpea Soup with Herbs Ingredients: 500 gr di chickpeas, 100 gr of herbs or chard, 60 gr of whole grain spaghetti, rosemary, half an onion, garlic, half a ladle of tomato sauce, 8 table spoons of extra-virgin olive oil, sea salt and pepper. Preparation: Cook the chickpeas for one hour in a liter of water. Meanwhile, lightly fry the onions in 3 table spoons of oil and half a glass of water. After a few minutes, add garlic and rosemary then remove after two minutes. Wash carefully the herbs, cut into small pieces and place in a pan with little water and salt. Let boil for 5 minutes, drain and pour in the pan with the onion. Add the chickpeas and lightly brown. Cover with one liter of water and let it cook, with a cover, for one and 1/2 hours. Drain approximately 20 chickpeas and put into sauce, then mix with the tomato sauce. When it boils, add salt and pour the pasta. 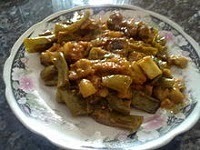 When cooked, season with the remaining olive oil and pepper. Lentils and Tomatoes Ingredients: 400 gr of lentils, 300 gr of tomato pulp, 100 gr onion, 100 gr of carrots, celery, parsley, 3 table spoons of extra-virgin olive oil, sea salt. Preparation: Boil the lentils with the parsley. After 50 minutes, lightly fry the thinly cut onion, carrot and celery. Add tomato and salt and cook over a low flame for fifteen minutes. Add the lentils. 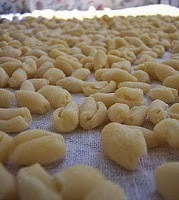 Cavatelli Ingredients: for 4 persons 500 gr. of cavatelli, 1 piece of pork, tomato paste, garlic, onion, hot pepper, extra-virgin olive oil, salt, ricotta from goat. Preparation: Place the oil in a pan and fry the garlic, the onion and the hot pepper along with the meat. Add tomato paste when the meat is brown. Lower the flame after the first boil and cook for about 2 hours. On the side, cook, drain and place the cavatelli in a bowl. Mix with the ragù and abundant goat cheese. 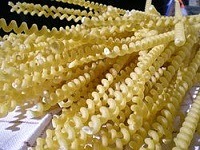 Fusilli Ingredients: Ingredients for 8 persons1 kg. of homemade fusilli, 500 gr. of pork, 500 gr. Of beef, 500 gr. of mutton, garlic, onion, hot pepper, extra-virgin olive oil, salt, goat cheese, 2 liters of tomato paste. Preparation: Place the oil in a pan and fry the garlic, the onion and the hot pepper along with the meat. Add the tomato paste when the meat is brown. Lower the flame after the first boil and cook for about 2 hours. On the side, cook, drain and place the fusilli in a bowl. Mix with the ragù and abundant goat cheese. Pasta with Black Truffles Preparation: Wash the truffles (50 gr.) under running water with a small brush, finely grate the truffles and mix with a few table spoons of oil and a bit of salt. Mince bacon (50gr), place in a pot with butter (50 gr.) and let it melt without frying. Cook the pasta (40 gr) preferably penne rigate, drain and season with cream, the truffles in oil with bacon. Simmer for a few minutes over a low flame and serve. Lasagna and Chickpeas Ingredients: Ingredients 6 persons 300 gr of chickpeas, oil, salt, garlic, hot pepper, 500 gr of lasagna. 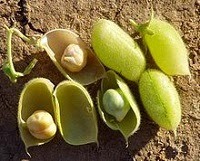 Preparation: Soak the chickpeas for 12 hours in abundant lukewarm water. 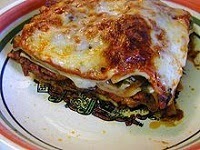 Prepare the lasagna, mixing water and flour till the pasta is compact. Cut in stripes. Cook the chickpeas and add salt. Cook in abundant water. Mix with chickpeas and season with extra-virgin olive oil and garlic. Serve warm. Chickpeas Soup Ingredients: Ingredients for 6 persons 400 gr of chickpeas, parsley, hot pepper, salt, extra-virgin olive oil, some garlic. Preparation: Cook the chickpeas and add salt. Place the biscuit bread in a bowl and pour the chickpeas. Season with extra-virgin olive oil, parsley, garlic and hot pepper. Serve warm. Pasta and Fave Novelle Ingredients: Ingredients for 4 persons 300 gr. of pasta (spaghetti type cut 3 cm. long), 300 gr. of fava novelle, 2 novelle small onions, extra-virgin olive oil and salt. Preparation: Peel the onions, wash and cut to thin slices. Place in a pan with 5 table spoons of extra-virgin olive oil, add the fava beans, add salt, mix and cook with a lid cover for about 10 minutes. Add sufficient water to cook the pasta directly in the pan. Let it rest a minute before serving. Polpette di Carnevale Ingredients: 1 kg. of potatoes, 250 g. of grated goat cheese, 5 whole eggs, 250 g. of grated bread, parsley, pepper, salt, extra-virgin olive oil. Time to prepare: 2 hours. Preparation: Boil the potatoes, peel and mash them. As soon as they cool, add cheese, eggs, grated bread, minced parsley, salt and pepper. Mix the paste and make small balls. Fry in boiling olive oil. Anchovies Ingredients: 1 lt of fresh tomato sauce, 1 kg anchovies, 3 whole eggs, goat cheese (enough to fill the eggs), olive oil, parsley, salt. Preparation: Clean the anchovies and remove bones. Cook the tomato sauce for ten minutes under a moderate flame. Prepare the filling with the egg, parsley and grated cheese. Place between two open anchovies. Add to pan with sauce and cook for ten minutes. Ciambotta Ingredients: for 6 persons 1 Kg. of potatoes, 1 Kg. of peppers, 1 Kg. of eggplant, 500 g. of small tomatoes, garlic, basil, extra virgin olive oil. Preparation: Slice the potatoes, the eggplant and the peppers. Fry some oil in a pot and add the sliced ingredients. Fry lightly in a pan for a few minutes cut garlic and tomatoes. Add the potatoes, eggplant and peppers, plus some basil leaves, mixing delicately. Serve lukewarm or cold. Escarole Ingredients: For two escarole: one egg, a tablespoon of grated goat cheese, two spoons of grated bread, a piece of garlic, parsley, two large-leafed escaroles. Preparation: the filling is prepared by breaking an egg into a dish, adding grated cheese and bread, garlic and grated parsley. After mixing, open the escarole and place it in the middle; thereafter, close the escarole by tying the top end with thread. Then, place one and 1/2 liters of water in a pot, add half a glass of oil with some salt. Upon boiling, add the escarole and let it cook. Scauratielli Ingredients: 1 lt of water, 1 kg of flour, 1/2 orange, lemon peel, 2 spoons of sugar, a touch of salt, 1/2 glass of white wine, 1/2 glass of olive oil, abundant olive oil for frying, some rosemary, honey. Preparation: Boil for a few minutes the water with the orange, lemon, wine, oil, sugar, salt, rosemary. Remove these ingredients from the water and add to the flour. Let it bake till the paste does not come unstuck from the pot. Place the mixture on a flat surface and beat with a rolling pin. Let it cool then cut in the shape of bows and fry in abundant olive oil. Place on a large, flat dish and add honey and sugar. Ricotta and Pear Pie Ingredients: 100 gr of chestnut flour with 100 gr of powdered sugar and mix with 100 gr of albumen and a pinch of salt. Preparation: Form two disks 20 cm in diameter each. Spread the flour on the first and cover it with the second disk. Add 280 gr of whipped cream and 20 gr of powdered sugar. meringue with 40 gr of albumen and a syrup consisting of 75 gr of sugar and 30 gr of warm water. Dissolve in the cream and the candied fruit. Mix with the ricotta. Homemade Bread Ingredients: flour (500g), water (250 cc), leaven, olive oil, salt, poppy seeds, sesame, sunflower. Preparation: Place a cube of bread leaven in a glass of lukewarm water with a half a teaspoon of sugar and wait 5-10 minutes. Pour the flour in a deep dish, adding the leaven and water, little by little, a teaspoon each of salt and oil. Place the flour mix upside down on a flat surface and continue mixing till it becomes an elastic ball free of the surface. Let it rest for 30 minutes to one hour in a deep dish with oil in a lukewarm oven covered with a cloth. 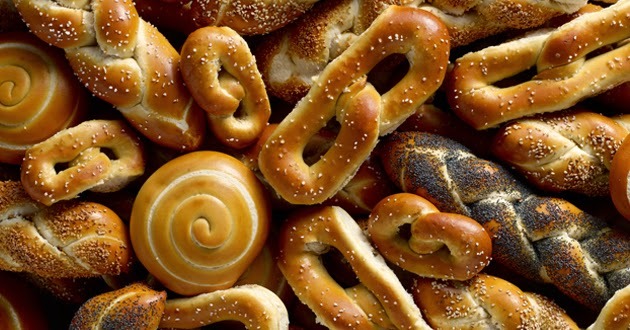 Create small loafs of the dimension and shape you prefer and add sesame and poppy seeds. Cut the dough with a knife or scissors then let it rest for 30 minutes to one hour in the lukewarm water. Turn on the oven to 180-200 degrees for another 30 minutes. If you prefer it crunchier and ticker let it bake an additional 5 minutes and ventilate the oven. Pizza Ingredients: Bread flour, a cooked tomato, grated goat cheese, oregano, garlic and extra-virgin olive oil. Preparation: Lay the flour in a baking pan, add the tomato, the garlic cut into tiny pieces, pour olive oil and place in the oven. After removing from the oven, add some goat cheese.